Mother and Child, pastel on paper, 1937, 18 x 14 in. Paul Cézanne (1839-1906) Rideau, Cruchon et Compotier, oil on canvas, 1893-94, 23½ × 28¾ in. Carl Schmitt, Still Life with Apples, oil on canvas, c. 1932, 22 x 26 in. Carl Schmitt did not object to “modern” art because it was new or contemporary, but because it was nostalgic. 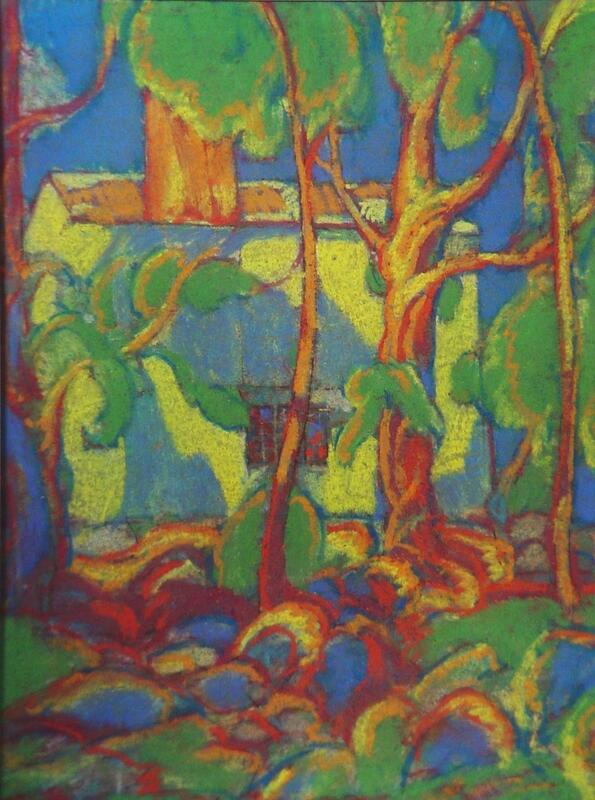 House in Silvermine, pastel on paper, 14 x 10 in. Schmitt’s delight in the forms and colors of nature sometimes led him away from the strict representation of what he saw before him. Schmitt’s fundamental issue with “modern” art, then, goes deeper than abstraction. It also goes beyond the other objections against it most commonly heard today: its obsession with originality, its commercial aspect, or even the popular concept of art as “self-expression.” Although he voiced all of these concerns, he saw them as symptoms rather than the essential problem. 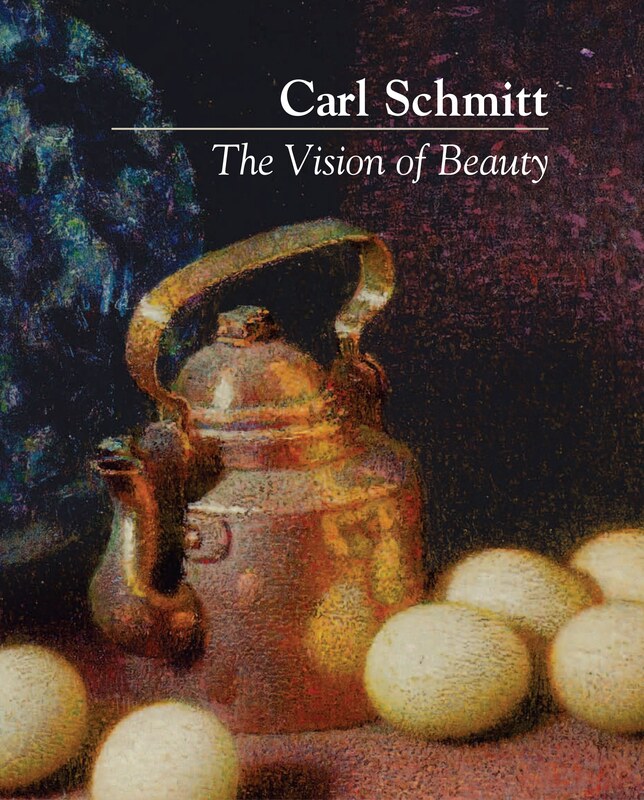 For Carl Schmitt, art is an objective reality. He saw art as “expressive,” but only if this means that the arts “express” transcendent realities. In his book Europe and the Arts, he defines the arts as “those forms made by man, which have survived the ages, [and] have been the expression, or symbols, of a vital spiritual life.” The notion of art as the expression of the artist’s personal, aesthetic, or political opinions was foreign to his thinking. The “Little Red House”, oil on canvas, c. 1920, 18 x 22 in. As with abstraction and expression, the mistake of the moderns was not to make too much of art, but too little. In their struggle to free art from what they saw as the strictures of nature and custom through self-expression, they restricted it to serving ends lower than itself. Rather than progressing toward a new future, Schmitt saw modern artists regressing to a stunted form of artistic “expression” which denied the arts their full transcendent significance. How can art be more than a symbol? How is it able to embody “transcendent reality”? For Schmitt, the fine arts are possible only because of what he called “the revolution of Western Christian culture.” More on this in our next post. Jake Schmitt, pencil sketch of the artist’s father, 1915. The reminiscences of those who knew Carl Schmitt form an indispensable part of his legacy. They show in a vivid way that his thoughts on art, life, childhood, and religion were not mere theories but the expression of a lived reality. If you have memories of Carl Schmitt to share, I’d be delighted to hear from you. Please contact me at the Foundation at samuel.schmitt@carlschmitt.org. Self-portrait, oil on hardboard, c. 1965, 18 x 15 in. I can see now that this stemmed from my grandfather’s habitual focus on real things, from his profound connection with reality. This was palpable in the respect with which he treated each guest and the deep affection he showed his beloved wife. All this made a profound impression on me. Gertrude Knitting, oil on canvas, c. 1970, 25 x 30 in. To me, my grandfather was a “great man,” with his deep conviction and calm self-possession. Yet, although I was not old enough to enter into adult conversation, I was not just another “kid” to him. He and my grandmother were personally attentive to us “little people,” providing each of us with our own small chairs and space in the main room. 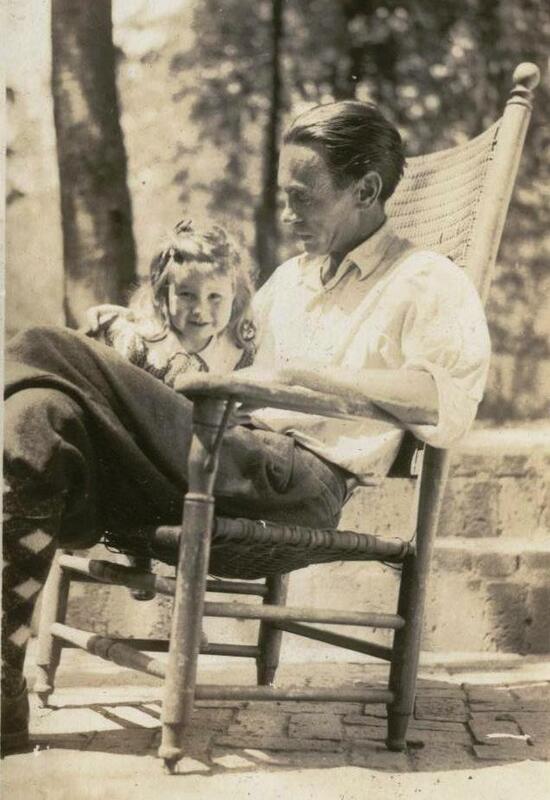 Carl Schmitt with his daughter Gertrude on the porch of their home in Silvermine, c. 1935. This affection and courtesy embraced everyone no matter his age. In this I sensed, even as a young person, something of my grandfather’s real greatness. This Reminiscence was first published in the Spring 2010 issue of the CSF News. “A Society is composed of individuals. Margaret Ryan, a good friend of the Schmitt family, holding her infant son Geoffrey. 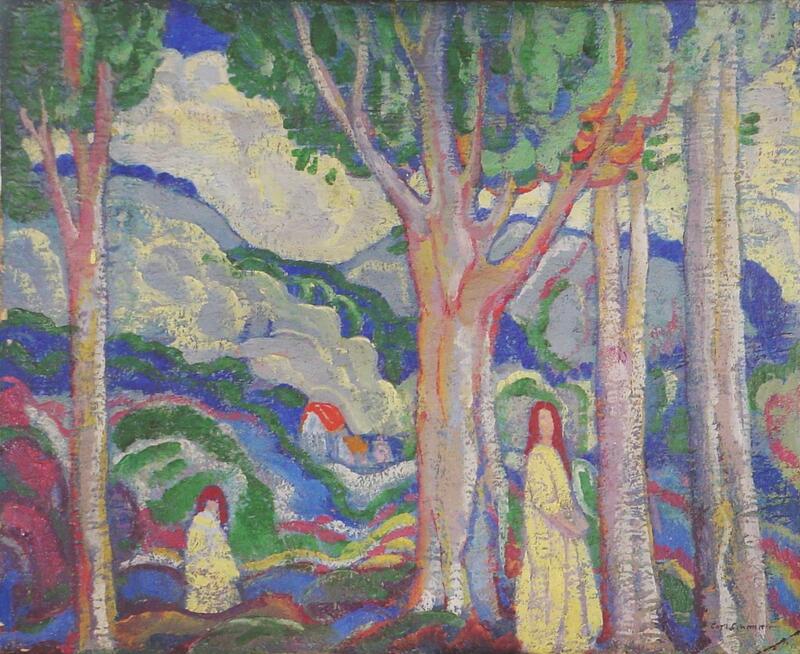 Pastel on paper, October 1933, 20 x 15 in.